I have kept tarantulas for as long as I can remember and think they are one of the most fascinating animals that there are. Unfortunately many people buy them on a whim, thinking it would be cool to own such a giant spider, forgetting that they can be a very long-lived animal and do require care to survive. The novelty oftentimes wears off and the owner has to decide what to do with his pet. First off, releasing them into the wild is not only unethical but it is also illegal. Second, killing them is morally wrong. So what is a tarantula owner who no longer wants to be a tarantula owner supposed to do? There are many options. First off, you can put an ad on someplace like Craigslist. Second, you could try your local pet store (most places like PetSmart or PetCo. will say no but many smaller mom and pop stores will usually take them for free), especially ones specializing in reptiles and invertebrates. Third, you can contact me. In most cases, if you are getting rid of it for free, I will take it and if you live in Rhode Island, Massachusetts or Connecticut I will drive to you to get it. With less common species, I will consider paying for the spider but this will be based on a case by case situation. Even if you cannot keep your tarantula anymore, at least give it a chance by giving it a good home. E-mail me direct at bugguy01@cox.net. Hi, I would love to adopt a brachypelma klassi (female) if you have one. I live in Washington state though and don’t know if you can ship. Please let me know, thank you. Hi Cody. I actually do not adopt out tarantulas. This blog was more about me adopting them for myself. Brachypelma klassi has become more available in the past year or so and they show up on many dealers’ lists throughout the United States. If you did a Google search for “Brachypelma klassi for sale” it should take you right to them! Good luck! I love all my T’s and I’d never let any of them go, but every once in a while I see posts about people who cannot keep theirs anymore and I’m not close enough. From now on, I’ll know where to refer them to! Do you have any that need home? Are any us tarantulas venomous? I do not have any that need homes. All tarantulas are venomous but their venom is very mild. It is designed to kill insects and not people. 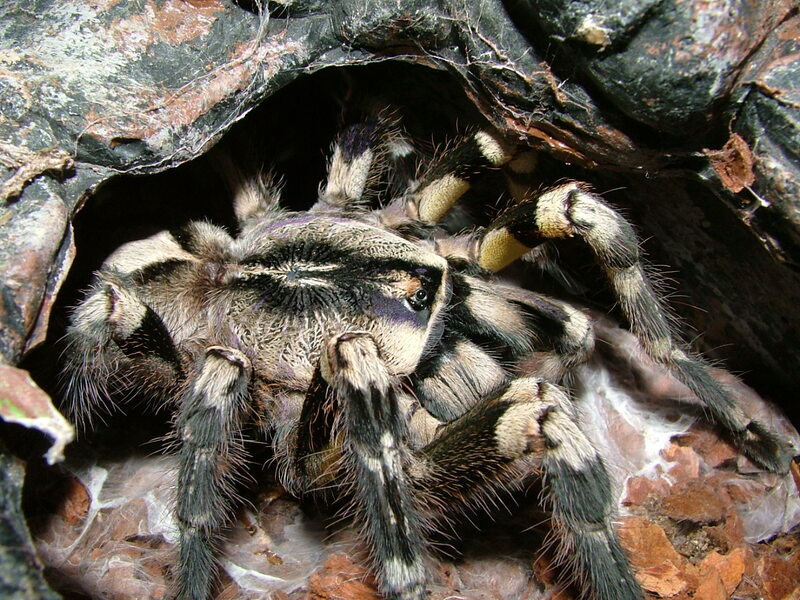 I have been looking for a Euathlus Parvulus( the Chilean Gold Burst Tarantula)for about 6 months now. I live in the United States, Indiana specifically, and have come to realize how rare they really are in the states here. Is there any way you can help? I have been looking for this one specifically to start my T. collection and won’t settle with another till I find one. Hey Robert. Try using Arachnoboards. Either place a want ad or try contacting a seller by the name of Joe Rossi on there (he always has ads in the classifieds section and seems to often carry the harder to find species. Good luck! I’ve never had a spider and I’m kind of scared of them. But I would like to. I would likeHave one to get rid of my fears. What is a good species for someone like me? And how do I get it? Hi. Thanks for writing. Since you have a fear, which is a natural reaction by a lot of people, I would recommend seeking out someone in your area who already has one. That way they can help you hands on. They can show you the proper technique for holding one and show you how calm they can be. They can also provide support should something go wrong (if a tarantula falls to the floor it will definitely get hurt and sometimes if they get nervous, they can move fast). If, after holding it, you feel you want to pursue getting one, I would recommend either Grammostola rosea (porteri), the rose hair or Grammostola pulchripes, the Chaco golden knee. Most pet stores carry rose hairs and sometimes the employees will be very helpful by allowing handling. Please remember though that even though they are just a spider, they are like all animals and need regular care and have certain requirements if they are to survive. They can also live a very long time (15-25 years with some females!). If you have any other questions, do not hesitate to ask! Good luck! I am looking for a homoeomma sp red female. I didn’t realize they would be this difficult to track down. I would prefer an adult female, but would be open to a juvi, or even a sling that I understand are more difficult to care for. It’s been awhile since I’ve seen adult females available. Jamie’s Tarantula’s often has babies available but she is currently out of stock. I would recommend going to Arachnoboards and checking the classifieds (or placing one yourself). Good luck! They are worth the hunt!